Student self-management is a primary goal at Bronx Arena, as it helps boost student preparedness for college and careers after graduation. Students at Bronx Arena have a great deal of autonomy provided to them, though it is gradually phased in as students show readiness for more responsibilities. The coursework is entirely self-paced, and the approach to instruction is quite different from traditional schools. Bronx Arena works to create an environment that provides structures and supports to students who need them, as well as a high degree of autonomy for those who don’t. Arena Introductory Course: This is an introductory course taken by all students new to the school. It helps them learn to operate within the school’s unique schedule, classrooms, and instructional approach. It also helps teachers gain insight into students’ interests, strengths, and weaknesses. The introductory course is one of the few structures that does not provide graduated autonomy, as it does not recur over a student’s time at Bronx Arena. Productivity Guidance and Banking System: Since every student can be working on something different, Bronx Arena provides general guidance that students should be completing five learning tasks per day. This guideline creates a baseline to monitor progress across students and subjects. They also have a “bank system” for students to bank additional tasks completed beyond the required five, or pull from their bank when they complete less than five tasks in one day. This system helps students manage their productivity over extended periods of time. Goal-Setting: Students meet with teachers to create a plan that outlines what courses they need to take – and when – in order to graduate. They set annual and monthly goals to ensure students are following their graduation plan and adjust these goals based on academic progress. Teachers and Advocate Counselors take more of an active role in this planning process for newer students and provide more guidance and thought partnership for those who have shown they are ready to own their planning and goal-setting processes. Facilitation Plans: Students and teachers meet to discuss what the student should be working on in any given week. While all students have a say, teachers will play more of an active role for newer students, while those who have shown they can handle the responsibility are encouraged to own more of their planning process. Data Tracking and Ad hoc Supports - Based on student progress and facilitation plans, teachers will determine what supports students need and when they need them. Students are able to track their own progress and request additional learning resources as needed throughout a typical week. 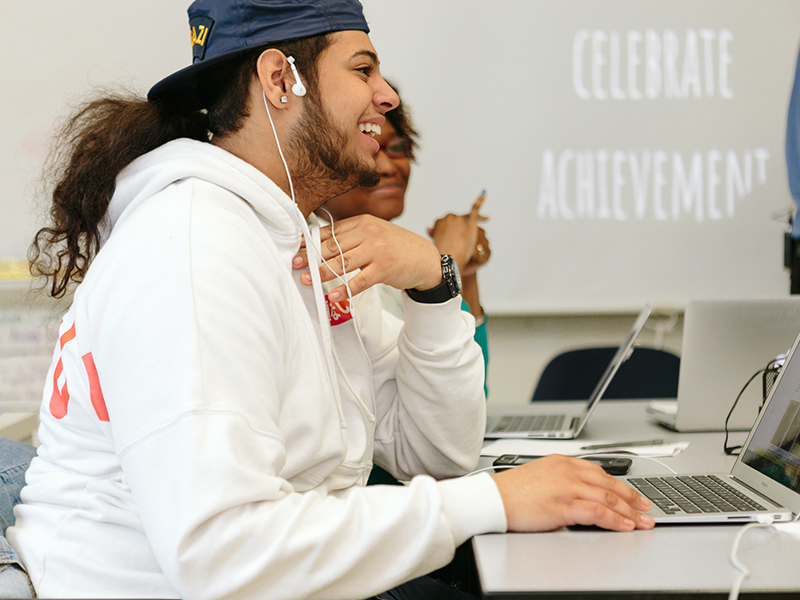 The goal of providing graduated autonomy at Bronx Arena is to ensure that students have enough supports to be successful but also work toward becoming truly autonomous by the time they graduate.